I've attempted to import a form from a different account using the import form feature. The imported form loses some of the header fields as well as the condition information. 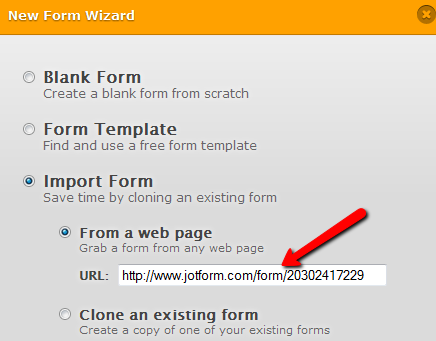 Is there any method to perform an exact copy of the Jotform without losing any elements of the form? Also, I am using the embed code for the import form entry field. Is that the correct url I should be entering? Can you please provide us the form URL? I also would like to try to clone the form. I have cloned the said form. The headers and conditions are all there. It's an exact duplicate of the of the original form. I've found out what my problem is. I'm trying to transfer from the Jotform website into a seperate Jotform system hosted on our university servers (jotform.oursite.com). Is this a problem on our end? Since this is a self hosted version (jotform application), you would need to download the full source code . Is there a method of inputing the full source code into the Jotform application? Regarding to further explanation related to Jotform Application ,it is better to consult to 2nd level support.